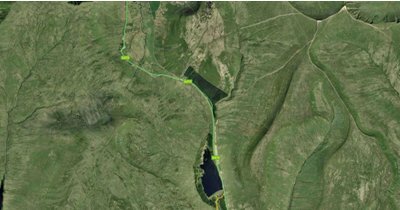 Back in November 1989, my girlfriend Katie Francis, and her great aunt Janice had a stunning close encounter with a UFO while crossing the Brecon Beacons. It is something that even after all these years they remember quite vividly. After interviewing them both about the incident I can now reveal to you what occurred. At the time of the sighting, Katie was eleven years old and her brother Tim was five. They had been on holiday visiting Janice at Leamington Spa. She was driving them home to Neath in South West Wales. Their journey took them across the Brecon Beacons moor. It was early evening and quite dark in the sky, but the moorland was still partially visible. The weather was clear and there was very little cloud. The road was deserted and there were no other cars on it. Katie was sitting on the back seat next to her brother and staring out of the back window of the car. She noticed in the sky an object with a row of coloured lights along it. The object was quite far away and high up. There were too many lights along it to be a normal aircraft. They were flashing and changing colours, mostly white and red, but some other colours too. The object was moving slowly across the sky. Katie alerted her great aunt to the object, and she also glanced back at it. The object seemed to keep changing position in the sky. It was there one minute, gone the next, and it kept reappearing in different places in relation to the moving car. Janice was trying to scare Katie and Tim about the object, saying it was going to come and get them. Suddenly, the object appeared much closer to the car and much lower in the sky, Katie estimates under 100 foot up. Both Katie and Janice could now clearly see that the lights were in a curved line as if along the edge of a large disc shaped object, however the main body of the object could not be seen. Katie estimates that it was at least twice as big as a house. It was behind and to the right of the car hovering in the sky. At this point Janice decided to stop to get a photograph of the object as she was very interested in what it could be. She pulled up at the side of the road and got out. She went round to the back of the car and opened the boot to get her camera. The object appeared to now be stationary and it was completely silent. Katie started to panic at this point and was screaming at Janice to get back in the car. Janice was also a little unnerved by the object, but mostly fascinated by it. She got the camera out but couldn’t work out how to use the night setting on it. Because of this, and the fact that Katie was very frightened, she decided to get back in the car and continue driving. After this. neither witness looked back to see if the object was still following them so it was not seen again. Janice also informed me of something else unusual which occurred. Shortly after they continued on their journey, there was suddenly a huge glow of bluish-white light that lit up the hills in front of the car. The glow lasted for up to ten seconds before dying away. Janice felt it was linked to the object which they had seen but because Katie was frightened she did not tell her about it. A baffled university don who spotted a UFO over the Brecon Beacons last night said: “There is no logical explanation.” Dr Simon Griffey saw lights loom over a mountain village – before they disappeared. His close encounter is the third reported in the space of just five days, following sightings by the Army and police. Simon, a doctor of psychology at Cardiff University, said: “I’ve had loads of theories proposed by friends and neighbours but none of them add up.” Dr Griffey, 50, and his son Jack, 23, were driving near Llangynidr Mountain in the Brecon Beacons, Powys, when they spotted lights over Talybont-on-Usk. He said: “There was no noise whatsoever, it was a bit eerie. I’ve driven over this mountain for 17 years and have never seen anything like it. There were seven lights and having read the description from the soldiers in Shropshire, there are some similarities. Sceptics have suggested the sightings could be huge man-made lanterns floating into the sky. But the boffin, of Llangynidr, said: “It was too big. It was way above the horizon and stayed there for 15 minutes. It was a bit smaller than a full moon – quite big and high up.” Jack recorded the phenomenon on his mobile phone – but when they examined the pictures later, they found only three of the seven lights showed up. To this day, both witnesses are convinced that the object they saw was definitely not a conventional aircraft or helicopter of any kind. 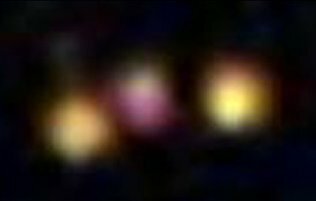 The arrangement and number of lights on the object, and the way that they were changing colours seem to suggest something very unusual. Janice and Katie both mentioned independently that the object was very large and disc-shaped even though the main body of it could not be made out. Also the object was completely silent even when it approached, and it seemed to be able to move or hover still in the air at will. 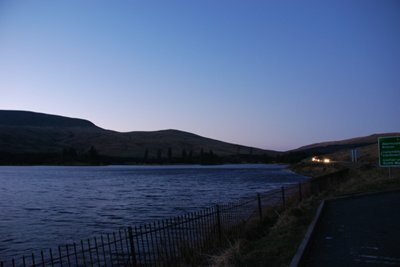 The area of the Brecon Beacons is used for military training and often jets are flown over it. Could the object have been a secret advanced aircraft of some kind? This is a possibility, but if this were the case then why did it appear to be following the witness’s car as if interested in it? Surely the pilots would have wanted to keep such a craft away from the eyes of the public? The glowing light that lit up the hillside shortly after the sighting of the UFO is also very interesting. The only natural thing which could possibly account for such a sight would be sheet lightning. However Janice said that it stayed visible far too long for it to have been this. Also the weather was clear and it only occured once so it seems very unlikely that this would have been the cause. In all the years since the years since the incident, Janice has never seen anything else like it, even though she has driven over the Brecon Beacons many times. Thanks to Craig at www.bufog.com for sending along the article.